There is no history of novels or fiction written with images, either in its broadest sense that would include medieval illustrated manuscripts, or in a narrower sense that might include the late Romantic, modern, and postmodern books I am studying here. It would be possible to begin a history of “writing with images” with Greek manuscripts, such as Euclid’s or Archimedes’s, which originally had illustrations. Or one could begin in the middle ages, with marginalia and other illuminations. Or in the Renaissance, with the Hypnerotomachia poliphili or its later French analogues such as the Horus Apollon (c. 1544). Or in the later Renaissance with German mystical and alchemical texts such as van Franckenberg or Henrich Kuhnrath. (My What Painting Is has some things along those lines; for the French work see Tom Conley’s writing, and the Bibliography of 16th Century French Books, 1964.) Or ideographic writing in the 17th and 18th centuries from Kircher onward, as studied by Barbara Stafford; or with the diagrammatic impulse as it manifested itself in the Encyclopédie. (For that see Culture of Diagram.) Or, obviously, one could opt to begin with non-Western traditions. Aside from the Chinese, Japanese, and Korean practices, each of which has its own literature including a critical lexicon, there is also Mayan writing, with its own contested pictoriality; and many others from Egyptian hieroglyphs to Vinca script. (Some are in On Pictures and the Words That Fail Them; others are discussed in The Domain of Images.) Or one could begin in the 19th century with novels printed with images, even though those images were not usually chosen by the authors or planned in the writing. And finally, one could begin as I would like to, with Georges Rodenbach’s Bruges-la-morte, the first fiction imagined and planned with images. Even this relatively recent starting point is problematic, because the history is not continuous after Rodenbach. There are a number of different independent lineages. W.G. Sebald, for example, was not influenced principally by Breton in his use of illustrations, as is sometimes assumed. Breton, in turn, may never have seen the illustrated version of Rodenbach’s Bruges-la-morte. Because there is no one history of the subject, there are many partial histories, and each novel that has images has to be considered individually to see which sources its author might have known. I will discuss these sorts of problems in the various close readings, rather than in a separate chapter, because the history is so discontinuous that it scarcely makes sense to treat it as a separate subject. A bibliographic survey of this part of the subject has been assembled by Terry Pitts. He keeps two lists: one on LibraryThing, and others on his Vertigo blog. There are also just a few books theorizing writing with images: Renee Riese Hubert, Surrealism and the Book (University of California Press, 1988); Ofra Amihay and Lauren Walsh, The Future of Image and Text (Cambridge Scholars Press, 2012); and a short section in Brian McHale’s Postmodernist Fiction, on the subject of illustrated fiction (which McHale calls “anti-illustration”). (Thanks to Terry Pitts for pointing me to all three of these.) The lack of a single continuous history will be a recurring theme in what follows. Pitts calls the subject of this project “embedded images,” but I don’t find that especially felicitous, with its double overtones of war correspondents and sexual misbehavior. “Captionless images” might be better, but doesn’t include the question of call-outs. I like “included images,” even though it’s not very expressive, but my preferred term is “writing with images,” because it is simple and sounds friendly, as if the writing and the images are friends. My sense of this subject is that “writing with images” as I am studying it here is conceptually sufficiently stable, but historically fragmented and multiple. Hence this project is not a history, but a conceptualization. It is possible to narrow the field further. A fairly high percentage of books on Pitts’s lists do not concern me here, because they use images as illustrations or ornaments, or because they use images without much care for how they work with the text. My proposal in this project is that writing with images is a definable project, and that there are therefore more and less interesting things to be done with images. The chapter “An Attempt at Theory” describes several sorts of uses of images I think of as uninteresting; they include the usual forms of writing in art history and other humanities, in which images are examples, illustrations, mnemonics, or ornaments. A number of recent novelists have used images in these ways. I’ve developed some ideas about less interesting uses of images on another page. 1. Call-outs. It matters, in this project, that images not have “call outs”: nothing should interrupt the text with a scholarly parenthesis, instructing the reader to see plate 35. Yet this isn’t a strict rule. In some places, Tim Clark’s The Sight of Death has these call-outs, because the exigencies of formatting a small trim-size Yale Press volume required some shifting around of pictures. But for the most part that book, and others that concern me here, make do without those interruptions. A call-out can be as harmless as any parenthetical reminder (given that parentheses are always a bit annoying by nature), but it can also be as insistently intrusive as the so-called MLA Citation Style (Smith 2004: 129-34) which creates an unreadable bump in the narrative (Oates 1972, Rushdie 1987, Szigmond-Hallavy 2012b). The idea of excluding excluding books that use call-outs is to get away from business as usual in art history, art theory, visual culture studies, and other humanities and social sciences. An author who is alert to what is happening with images may want to use call-outs, but an author alert both to her images and her writing will feel a little pinprick at the insertion of each call-out (Lotringer 1982), each interruption (see fig. 13), every small gesture in the direction of academic authority (LaCapra 1996, Derrida 1982a, Agamben 2011). It’s likely that a writer attentive to the pull of images and the power of the text will want to avoid call-outs. This is a small matter, but I think it is a crucial symptom of the academic. 2. Captions. Another quality of scholarly writing that I would like to avoid is the caption. Under what circumstances do images need captions? In science, images often require technical explanations; and in long textbooks, hundreds of images need to be labeled for cross-references. Sometimes agencies that hold copyright require that they are acknowledged on the same page as the illustrations they license. But in art history captions are more custom than necessity. My office bookshelves are full of art history books that did not really require captions. Scholarly books in art history usually have either a List of Plates in the front matter, or a List of Photo Credits in the back matter, and either one would be enough to help readers locate images without captions under each image. Like call-outs, captions are an academic habit. Clearing them away can help focus a reader’s attention on what the pictures are doing. 3. Books with minimal continuous narrative such as Leanne Shapton’s Important Artifacts, a novel disguised as an auction catalogue. This means I’m also not interested in visual encyclopedias and dictionaries, certain atlases, and other texts that pair minimal text with many images. “Minimal narrative” is also a way of describing what happens in mathematics, where language may be minimal, even though there may be plenty of formulas and illustrations. Many artist’s books have minimal continuous narrative, creating a reading experience different in kind from the narratives that concern me. 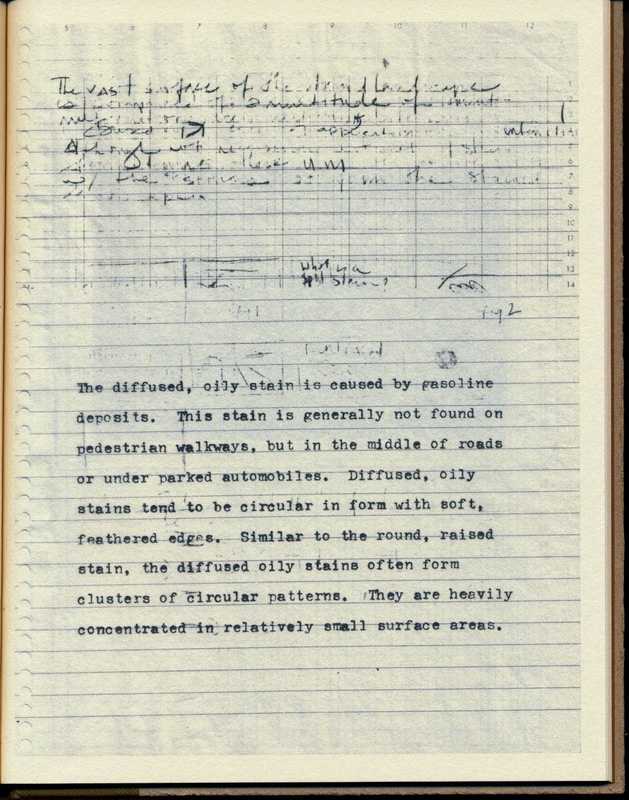 A typical example is Ellie Ga’s Classification of a Spit Stain, which is full of faux-scientific spreadsheets and diagrams of stains. It can almost be read from first page to last, and I have read it that way. But its readability, in that sense, is dependent on the fact that it’s a short book, and there are only nine narrative passages. 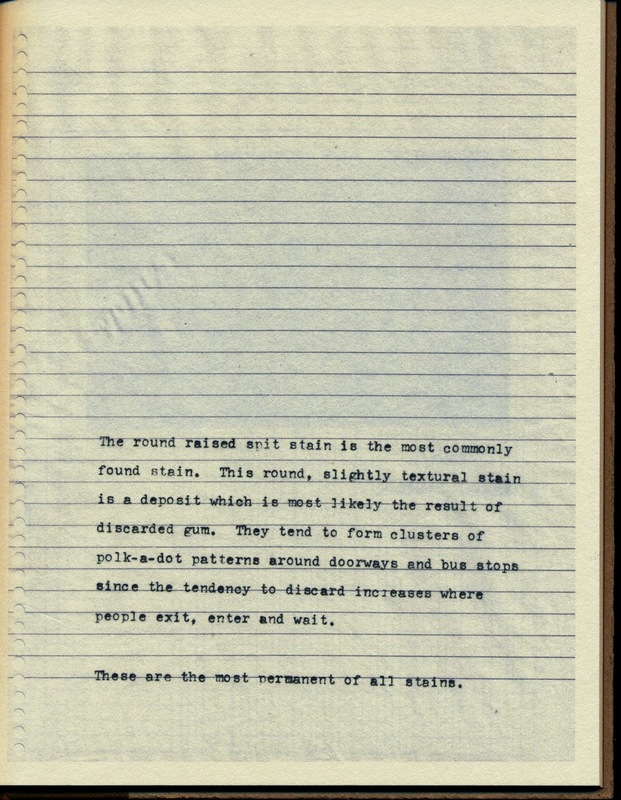 And even here, there are pages with unreadable palimpsests, which are signals to the reader that it isn’t necessary to try to read everything. Longer artist’s books that can be read through, or ask to be read through, or hint that someone with patience and time might read through them, are rare. The idea of asking for continuous narrative, or the promise of it, is to focus on texts that ask, implicitly, to be read through from beginning to end. That doesn’t mean such books actually are read through. I have read every footnote in Infinite Jest (the entire audiobook takes only 38 hours), and every one of the 1,200 pages of notes in Nabokov’s edition of Eugene Onegin, but not every note in Pierre Bayle’s Historical and Critical Dictionary. It’s not so much a matter of texts that actually are read from the first page to the last, as it is of texts that suggest that possibility, and therefore minimize the invitation to read or look at random. I think that possibility raises the stakes of writing with images by insisting on the possibility of narrative. 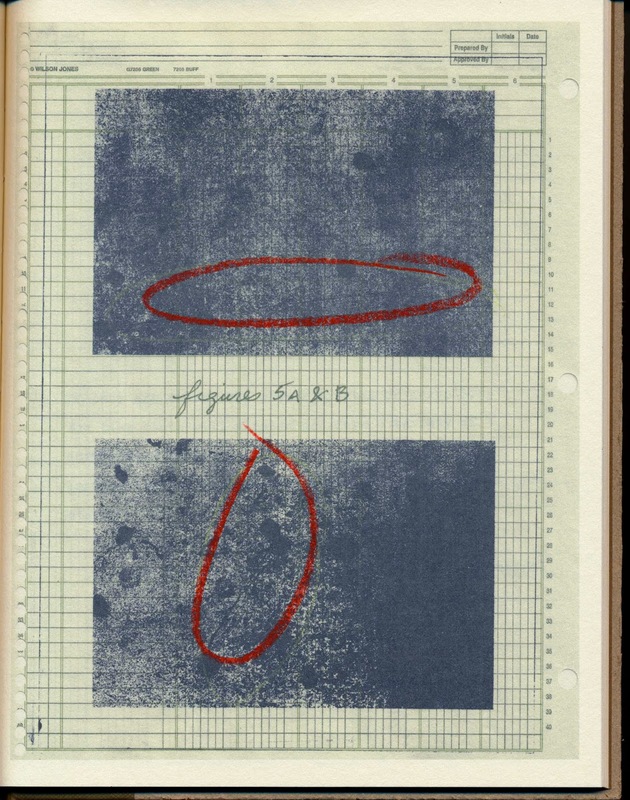 Classification of a Spit Stain is a beautiful book because Ugly Duckling Presse, the publisher, has given it an intentionally low-tech, low contrast, Xeroxed look. I like the book, but imagine how much more challenging it would be if it had a denser, more continuous narrative, so that I would be asked to study these things, learn them like the author seems to have done, memorize their shapes, follow along, discriminate, classify. Each time I am given permission to thumb at random through a book, reading becomes more a matter of aesthetics: in this case the message becomes the poignance of the overlooked, the poetry of the everyday, the slight surrealism of the despised and forgotten, the absurdity of taxonomy, the foibles of natural history, the failure of systems, the hopelessness of understanding the world by studying it. All those subjects can be expressive, but they work by signifying as a whole: Classification of a Spit Stain gives me one single accumulating impression. Its themes and ideas do not grow on me page by page, they don’t gain intensity as I read, they don’t compel sequential attention. Ga’s book could be 30 pages long or 3,000. It could have one spreadsheet or dozens, a single labeled image or hundreds. It does not have a necessary form. Continuous narrative, whether it is presented as fiction or nonfiction, and individually placed images, whether they are art or not, are the conditions for the most conceptually challenging engagement between writing and images. This isn’t to say that discontinuous narratives and experiences of reading can’t be interesting, but I think they are mainly when the impetus is to read through, to follow a narrative. A good example here is Barbara Browning’s I’m Trying to Reach You has cell phone pictures in it, but also screen shots from YouTube videos. Some of the screen shots have the progress bar visible (p. 134), and the narrator sometimes mentions the exact time something happens. One the dedication page there is a QR code and the note: “All of the moth’s videos can be viewed at: www.youtube.com/AhNethermostFun/.” As the plot unfolds, “the moth’s” videos become turns out to be central, and so do the users’ comments, some of which are quoted in the book. It is possible to read the book without looking at the videos online, but the reading experience is more interesting if you check YouTube as you read. The narrative, and the presentation of the book itself, suggest two different relations between the experience of reading and the possibility of viewing the videos. On the one hand there is the QR code at the beginning, and the many passages in which the narrator tells us how many times he’s seen each video. 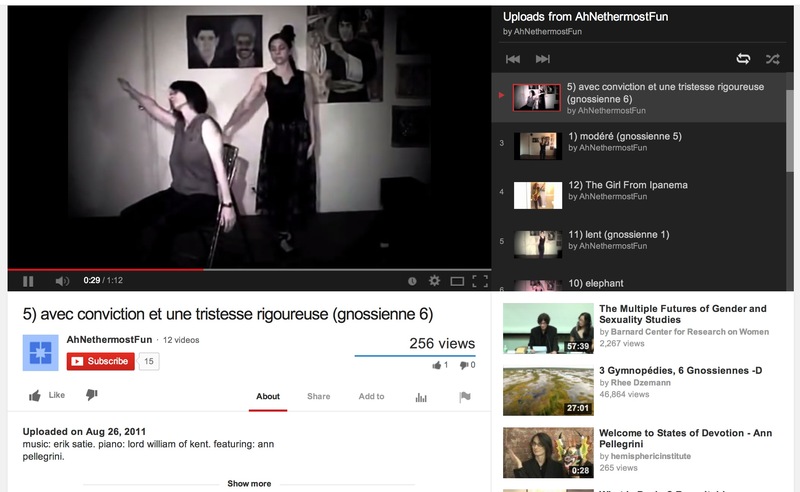 On the other hand, there are some extensive ekphrases of particular scenes in the videos. Most of the time, those passages keep me focused on the text, because they are presented as self-sufficient descriptions in the manner of traditional ekphrases. Occasionally Browning’s descriptions make me curious about the videos, but I only checked the videos intermittently. Overall the book seems undecided about the role of the videos, and that indecision is not itself a theme in the book. 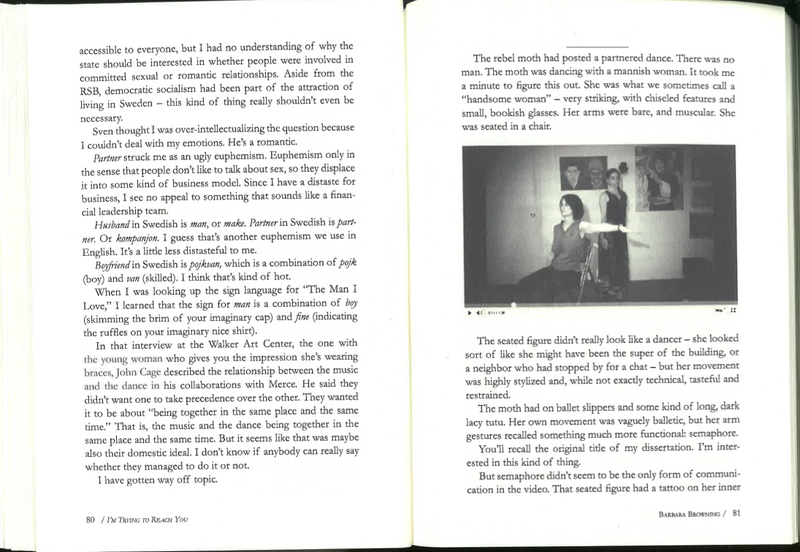 Browning makes the veil between her novel and real life even thinner by including a double author’s photograph that has a very strong resemblance to the dancer called “the moth” in the videos. (She also left at least one of her original videos on YouTube with her name on it instead of “the moth.” Why doesn’t she expect that readers will see that she’s “the moth”? It’s not clear if she doesn’t care or hasn’t thought readers would notice.) All these coincidences and straightforward realities make the experience of watching the YouTube videos more a part of the book’s purpose, but in the end, for me, they did not fit. To be consistent, she could have published everything as an e-book, or also posted the cell phone pictures online, or included more screen shots so readers didn’t feel they need to go online. Still, the project is memorable because of the narrative impulse: it’s interrupted, fragmented by the hyperlinks and videos, but still more powerful than the competing urge to view or read at random. Those are some of this project’s many exclusions. None are meant dogmatically: they are just to keep the subject manageable, and to help focus on the central conceptual problems. In Chapter 2, I continue to define the project, but I will end here with a note on contemporary novels in general. As I say at various points, this is all personally motivated: I am trying to discover a territory in which I might write. I do mean these pages to be helpful to scholars and readers, but they are in the end practical aids for my own project, which is a novel with images in it. To that end, it may be useful to say a few words about how “writing with images” might bear on the state of the novel, and experimental (or literary or serious) fiction in general. The “death of the novel” is a trope in the history of modernism. There’s a clever post, written in response to a piece by Will Self declaring the death of the novel, that supplies a half-dozen examples of the death of the novel, going back to the 1880s. Other responses to Self’s piece gathered additional examples, but it doesn’t answer anyone’s argument regarding the death of the novel to say that its demise has been declared since the late 19th century. The same can be said of the many claims that painting is dead. It doesn’t matter that the thesis can be proven wrong: what matters is that the repeated claims regarding the deaths of painting and the novel are tropes in the history of modernism: they are necessary accompaniments of the ongoing modernist project. Self’s arguments in the essay are unfortunately miscellaneous and poorly fit to one another. His main jeremiad has to do with the rise of digital culture, but he seems to imply that there might be internal, structural reasons for the end of the novel when he mentions Finnegans Wake and Beckett as the two principal last novelists. That points, I think, in a more promising direction. My own concerns about the “death of the novel” trope are about the novel’s structure and purpose. Here are some reasons other than the digital revolution to think the novel may be dying. 1. It is said that the novel was a bourgeois invention, whose political purpose has always been the construction of the middle class. This has been claimed since Benjamin and Adorno, and it is currently being explored by scholars like Mariano Siskind. To the extent it is true, the enterprise of writing novels can only make sense if the author is concerned—consciously or not—with the preservation, critique, or celebration of forms of the middle class, its family values, its cultural identity, and the ways it might be shepherded into the next generation. 2. The novel’s structures, devices, and emplotments are said to be hackneyed. Free indirect speech has been explored since Woolf and Joyce; the maximalist novel was tired long before David Foster Wallace, Jahn Barth, or William Gass; the rule-bound novel was exhausted by the time of Perec; the minimalist novel was done before Lydia Davis or flash fiction. Why, then, go on in any of those modes? 3. There is also the position that the modernist novel is dead, but that the novel — by implication the postmodern novel — isn’t. This may be a common de facto position, but it is articulated by authors like Zadie Smith when they say that there’s no reason to follow Joyce and Beckett, because their innovations, which were done in language, aren’t the only innovations. (Smith says that for people who feel “at home in the canon,” the only imaginable innovation “is a radical departure at the level of form,” but that “there’s innovation everywhere,” just not “the familiar Joycean form.” That’s in The White Review, no. 15, 2015, p. 24.) Smith says her novel NW, for example, is about the collapse of social mobility for some people in London; she presents that as something as new, in its way, as what Joyce or Beckett did to language. 4. The novel’s purpose as an expression of interiority is said to be vitiated by the rise of poststructuralism. This claim is also implicit in other media such as music (thinking here of aleatoric work, and Babbitt’s and Boulez’s total serialism). I recently discovered, the claim has also been made about music of the first half of the 20th century, by Ton de Leeuw, who contends that the idea that music should be expressive is itself the hallmark of romanticism, and was effectively given up by the first generation of modernists after Debussy. In the field of fiction, this claim is mainly associated with contemporary conceptual poetry—as theorized for example by Craig Dworkin and Kenneth Goldsmith, or in Jacket2. I have ad hoc arguments against each of these. 1. The first claim ignores, for example, the Russian novel, which has been said to depend on the absence of a middle class. (Who is middle class in Dostoevsky?) Not all novels are primers for bourgeois life. Canetti and Nabokov certainly aren’t, for example, and what could be said about someone like Bernhard, who dislikes everyone from the stunted Austrian peasant to the myopic prince? There are more forms of sociality and anti-social thinking than are imagined by middle-class critique. 2. The second argument is false history: it condemns the present for not finding new models, but the present has always found new things—they just aren’t apparent if you’re taking inventory of the past. Unless it’s a matter of signing on to write the next maximalist novel in the manner of Musil, Schmidt, or Szentkuthy, it shouldn’t matter that certain identifiable modes are exhausted. 3. The difficulty with positions like Smith’s, I think, is that they mix two different things. Joyce’s language, broadly construed, was the form of the project of the novel as he experienced it. A book like Smith’s NW introduces new identities, cultures, and ethnicities, but that begs the question of the form and project of the novel by reducing it to its content. Her argument is familiar in the visual arts, where gender, politics, and identity have often supplanted form, which is considered “optical,” modernist, or inadvertently ideological. This is not to say anyone wants to return to Joyce or to modernism: but it is crucial, I think, that NW borrows many of its narrative devices from Ulysses: it is often unconsciously modernist in form (and in that sense “on its knees” before modernism, in her phrase), even while it is deliberately postmodern in content. As always, the novel needs to be thought through in its entirety, both in subject matter and form. 4. For me this claim has the most bite, because de Leeuw is right in identifying interiority (Innerlichkeit) and expression with romanticism. (See M.H. Abrams’s Mirror and the Lamp.) It can also seem that writers like Musil, Proust, or Walser have wrung the last droplets of subjectivity out of narrative forms. However it isn’t difficult to see that contemporary conceptualism is thoroughly expressive, from top to bottom: supposedly inexpressive material is made expressive both by choice (as in Reznikoff) or reading (as in Goldsmith’s readings, both the notorious one and the one at the White House). Expression is explicitly under erasure (as in the anthology Against Expression, which disavows the very thing it does most consistently), so this fourth position is not easy to adjudicate at the moment. I don’t have a conclusion in relation to these arguments: just that worries about the digital, like Self’s, seem beside the point—they’re more about dwindling market share than the nature of the novel itself. More thinking is needed on historical and structural problems with the novel. But note that in this set of four positions, the image is absent, and that should be particularly worrying to writers like Self. (He has written at least one book with images, but I do not think he pays very close attention to what’s visual. It’s another example of uncommitted experimentation.) I would like to think that in this supposedly preeminently visual culture, it is crucial to think about how images and text work together, and that in itself might be a way forward for the novel. I haven’t finish going through all the pages, I don’t know if it helps, but have you read Photographie et langage by Daniel Grojnowski? It’s in french btw. And also Lire et voir series (ed. Daniele Meaux) – I only had acces to vol.1 – Livres de photographies et de mots. Also a more particular work, La Mort et les Statues by Jean Cocteau and Pierre Jahan, I recommend to check it out, since the text was written after photos and the latter are not a mere illustration of the text, neither do they directly describe the photos (there was also an article written about it by Kathryn Brown). Thanks for those! I found the series here, and it’s good to see the excellent Jan Baetens contributing a volume.